1. Unplug your appliance from the wall outlet. Simply unplug whichever electronic device you’d like to place on the timer from your wall outlet and leave it unplugged for now. 2. Set the on and off intervals for your timer. Typically these timers are used in 12 hour cycles (which will be marked by one white and one black interval on the face of the timer). Turn the dial so that the arrow which indicates the current time is set to your current time. Now compress the intervals for when you would like the timer to provide power to your electronics. For example, if you’re going to be using your timer in conjunction with a coffeemaker, and you only use your coffeemaker from 6am-8am, compress the intervals from 6am-8am to create your on time. This way your coffeemaker will only receive power during the on interval and the timer will prevent power from being drawn by your device for the remaining 22hrs of the day. 3. Plug in your timer. 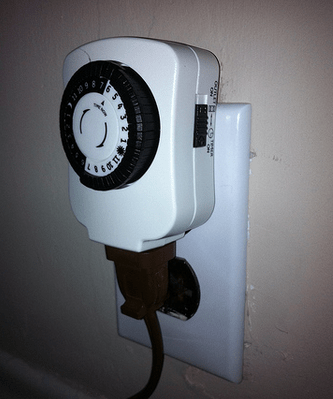 Now that you’ve set your on and off intervals for your timer, go ahead and plug it into the wall. Just be sure that your timer is set to have the timer engaged and running, otherwise your electronic device will continue to draw power and add to your monthly electric bill. 4. Plug your appliance into the timer. Now all that’s left is plugging your device into the timer and letting it do its thing. It might be a good idea to test your timer before plugging it in and leaving it unattended. Try setting the timer so that it comes on 1 minute from your current time, and have it turn off after five minutes. If your timer works as you intend, then you’re ready to set the times for your electronic device and start saving money! Note: this is just one of many types of timers on the market…some are much more high tech, but for all intents and purposes, this is the basic framework for how they work. Since timers are also capable of programming, they not only eliminate vampire power but can also be set to avoid peak demand charges when electricity rates are highest.